Drain the soaked beans. Pressure cook them in 2 cups of water and no more than a pinch of salt. While they cook, wash the swiss chard, separate from the stem, and chop the leaves fine. Mince the green chilies. Process the cumin seeds, garlic and peppercorns. Then add the coconut to this mix with turmeric. Heat oil in a non-stick pan. Add the mustard seeds. When they splutter, throw in the dried red chilies, urad dal,and curry leaves. Allow the urad daal to turn light brown, then add swiss chard and green chilies. Stir and cook for around 4-5 minutes or untill the swiss chard has wilted. Next add the adzuki/red chori beans with a cup of warm water. Bring to boil, and then allow to simmer for 7-10 minutes. Stir in the coconut mix and continue cooking on medium heat for 4 to 5 minutes till the beans are mushy and the curry has thickened. 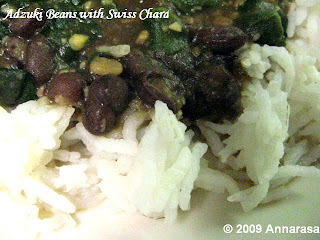 We are lucky enough to get greens throughout the year, and though I often prepared adzuki beans with fresh spinach, I adore the taste of these beans with swiss chard. Do try it and let me know what you think!! This lovely dish goes out to Laurie @ Mediterranean Cooking in Alaska. 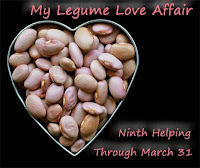 Laurie is hosting My Legume Love Affair - Ninth Helping this March!! MLLA of course is a well-loved monthly event created by Susan @ The Well-Seasoned Cook!! Good and so healthy. I can smell the aroma of ur dish here. Hello Annarasa,I followed you from the foodieblogroll and this is a great recipe suggestion for swiss chard!Thanks for sharing this! I'd love to guide our readers to your site if you won't mind. Just add this foodista widget to this post and it's all set to go, Thanks! This looks very healthy to me, totally a new recipe and a must try version.